During the regular meeting of the Staunton CUSD #6 Board of Education held on Thursday, January 24, 2019 the Board authorized Superintendent Cox to post for six teaching positions. Two of the positions are made available as a result of pending retirements while the remaining four are made possible as a result of Evidence Based Funding. The positions to be posted are for two elementary teachers, one junior high language arts teacher, one special education teacher, one counselor, and one high school language arts teacher. "These positions have been identified through data analysis and stakeholder input as the most critical to support continued student learning and development as well as overall culture and climate," Superintendent Cox stated. With these positions the District will have added twelve instructional positions, nine teaching and three paraprofessionals since the beginning of the current school year. Cox further added, "The Board of Education and administration have made a strong commitment to not only balance the budget, but to also support our students and teachers." The addition of the new positions will continue to assist in lowering class sizes, providing for academic and behavioral supports, and support continued work on the overall culture and climate as the District recovers from the impact the state financial crisis made. In other action relating to student learning and development, district improvement, and strategic planning the Board approved American Institutes for Research as the District's Illinois Empower Learning Partner. This partnership will result in eight months of intense leadership development and school improvement planning for administrators and teachers. The first step in this process was the approval of the school improvement quality framework rubrics for Staunton Elementary and Junior High Schools. The Annual Budget Projection Report was issued to the Board. After balancing the budget for the first time in over a decade in 2018, Superintendent Cox reported that it is anticipated the District will close FY19 with a balanced budget once again. The Board voted and approved to keep all closed session minutes closed. 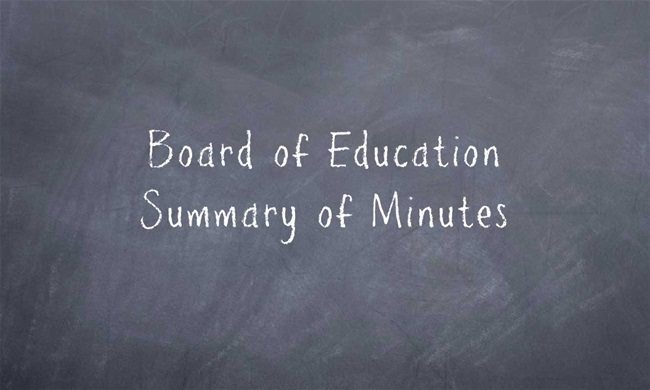 To learn more of all action and discussion items that took place during the meeting please view the summary of minutes on the District website.